Can You See Me Now? is a game that happens simultaneously online and on the streets. Players from anywhere in the world can play online in a virtual city against members of Blast Theory. No registration required, anyone can play this game online, from your home, office or come to the Come Out & Play HQ to play it on one of our terminals there. Tracked by satellites, Blast Theory's runners appear online next to your player on a map of the city. On the streets, handheld computers showing the positions of online players guide the runners in tracking you down. With up to 20 people playing online at a time, players can exchange tactics and send messages to Blast Theory. 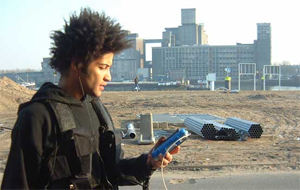 An audio stream from Blast Theory's walkie talkies allows you to eavesdrop on your pursuers: getting lost, cold and out of breath on the streets of the city. Can You See Me Now? is a collaboration between Blast Theory and the Mixed Reality Lab, University of Nottingham.